A home that will take your breath away! Not all architects are open to experimenting with designs and decor, since it’s not very easy to blend functionality and aesthetics. But the architects at Caio Pelisson Arquitetura E Design took that risk with this lavish and visually arresting residence. Modern lines, trendy furnishing, smart illumination, carefully chosen colours and beautiful materials make this home one of a kind. Come and take a closer look now to be impressed! The living room is simply wow! A part of the common area has been designed as a living space with a bold grey sofa and fluorescent yellow cushions. 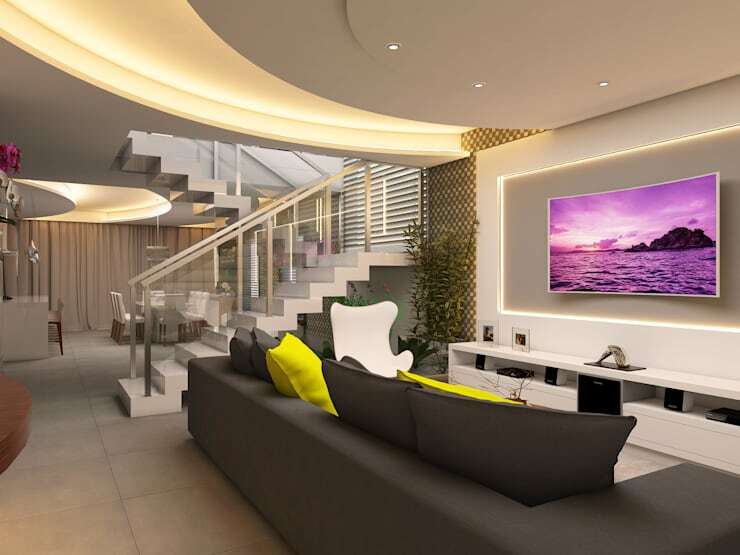 The sofa faces a sleek TV conveniently, and the staircase with glass balustrades ensures a feeling of visual openness. This spacious and gorgeous open kitchen merges seamlessly with the elegant dining area, making the home appear much bigger than it actually is. 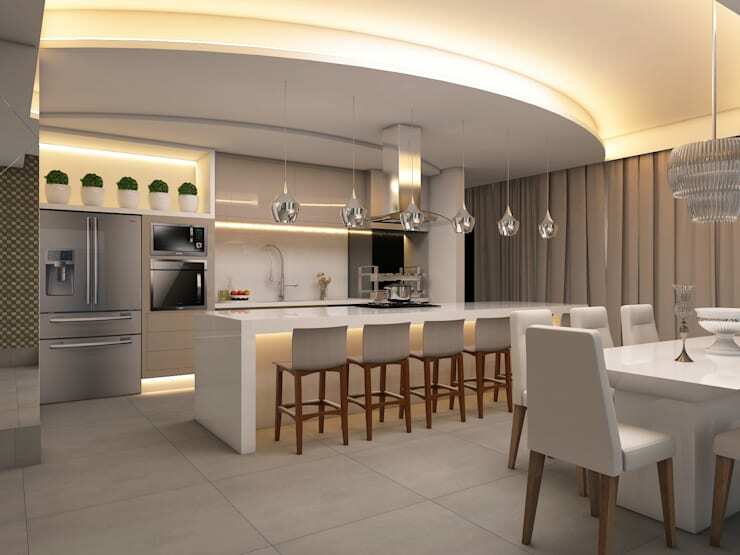 Rendered in soft whites and greys, this kitchen looks inviting with its inbuilt appliances and trendy lighting. 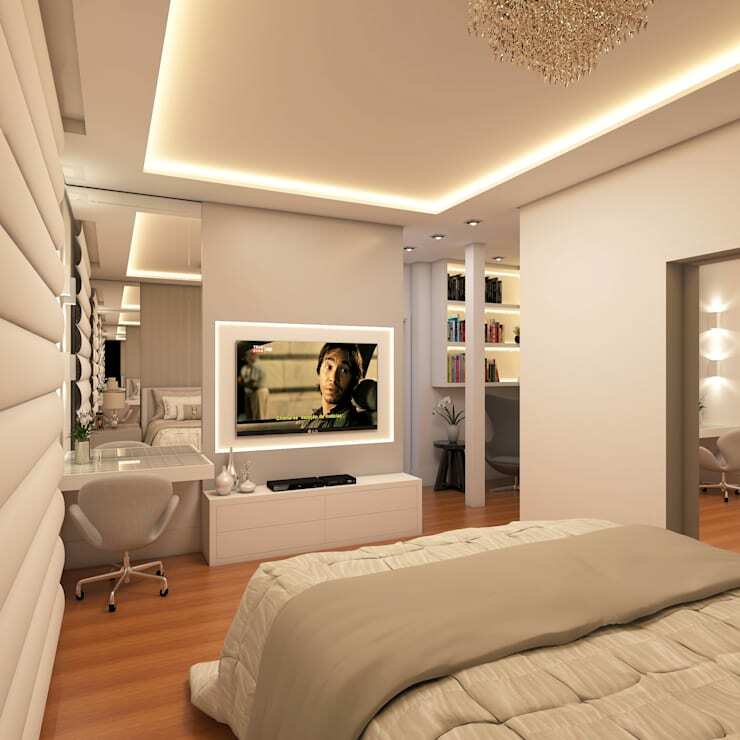 Soft beige and cream hues paired with clean lines and stylish indirect lighting makes this bedroom appear like the luxurious ones in a hotel. The wooden flooring adds warmth, while the large dressing mirror enhances the spacious feel. 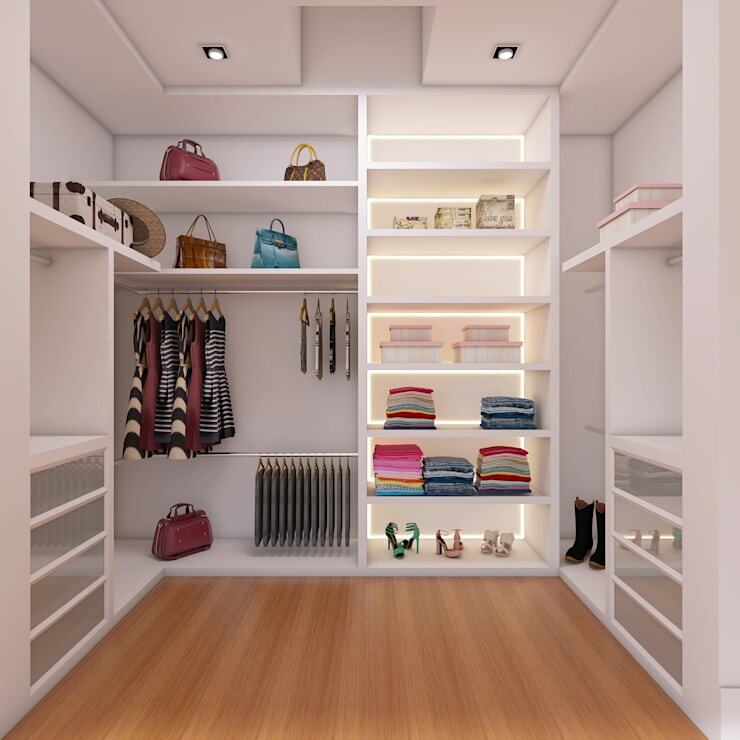 This wood and white and spacious dressing room features ample floor area for movement and neat shelves of different sizes for accommodating clothes, shoes, bags and more. 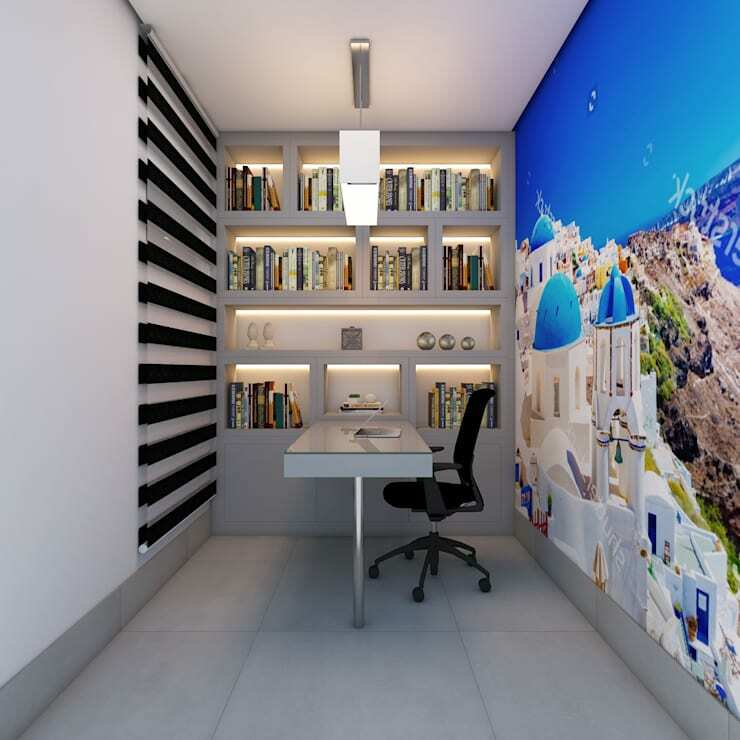 With a wall art depicting Santorini and neat indirectly lit shelves, this stylish study room looks fun yet focused. The furniture is sleek and minimal. Grays, yellows and greens come together to make the nursery a fun and creative space. 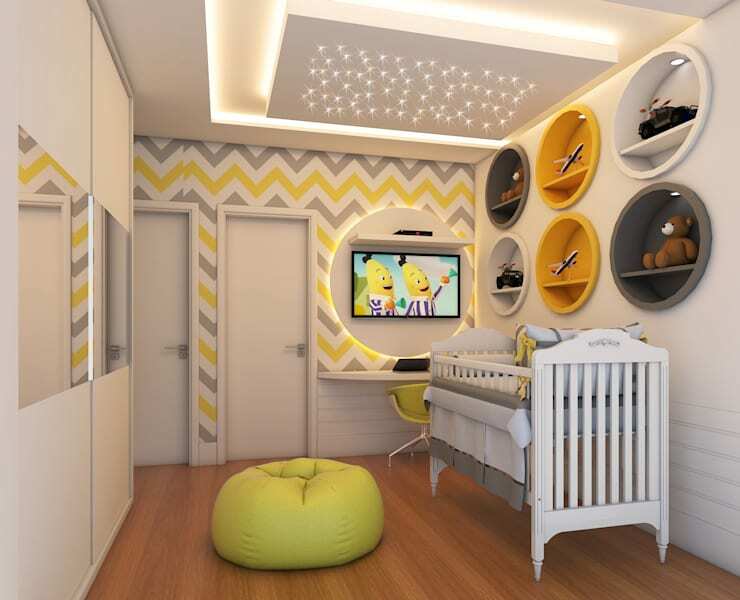 The chevron wallpaper, the quirky circular shelves, the twinkling lights on the false ceiling and the plush beanbag work together to tickle the baby’s imagination and help him grow joyfully. 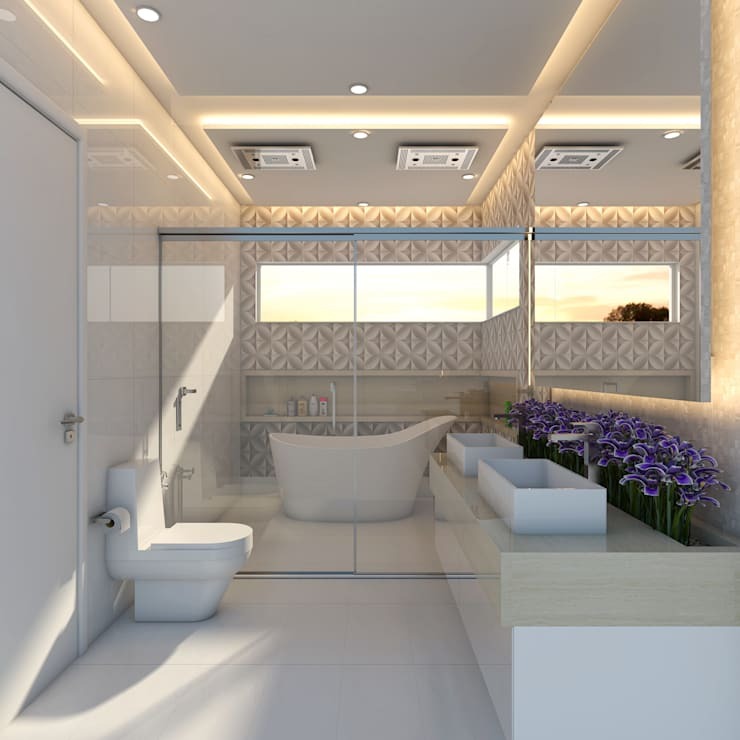 Smooth white surfaces, glass shower partition, a luxurious freestanding tub and neat double sinks make this bathroom a very lavish space for rejuvenation. The stylish tiles in the bath area and the beautiful purple flowers add visual interest here. Though the guest bathroom is very compact, it doesn’t skimp on style. 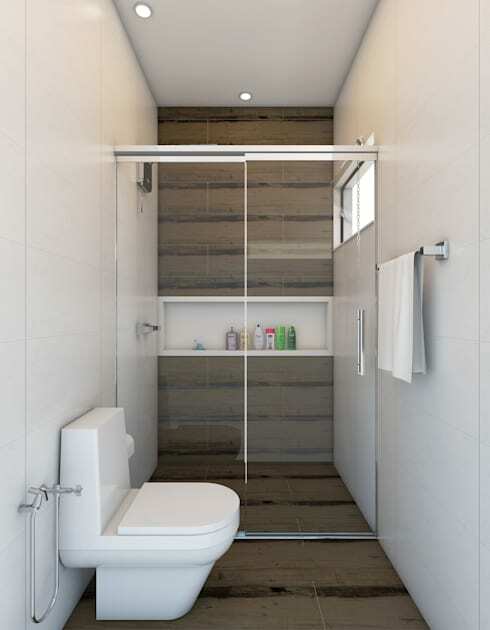 The grey and white colour palette is striking, while the modern fixtures and an inbuilt shelf in the shower stall add to the convenience.